Rise of the Green Dragon? This week the Obama administration convenes a meeting of 17 of the world’s major economies in a forum on global warming outside of the ongoing U.N. climate change process. Though the history of this Major Economies Forum is somewhat tainted, it may well provide a useful opportunity to engage China on global warming. There are ample indications that China is ready for such an overture from the United States if not an outright proposal for action. Obama’s Major Economies Forum builds on the legacy of the Bush administration’s earlier effort, which was designed as an alternative to the annual U. N. climate change talks that produced the Kyoto Protocol. The successor to that treaty, which will expire in 2012, is slated to be decided at the next U. N. Framework Convention on Climate Change meeting in Copenhagen in December. Bush’s effort was widely criticized for pushing an agenda of voluntary measures to combat global warming, as opposed to mandatory caps on emissions. Yet the former president’s push was also seen as an opportunity to pull the major carbon-emitting developing countries out of the voting bloc in which they are often embedded in the UNFCCC. This is the so-called “Group of 77,” which actually has 130 members—a group generally resistant to attempts to pick out members for bilateral or multilateral engagement. Enticing direct negotiation with the major emitting developing nations—especially China—is critical to getting a global climate change agreement inside or outside of the UNFCCC process. Estimates are that China is surpassing the United States as the world’s number one carbon emitter. On its current trajectory China will double its emissions by 2020, effectively negating even some of the most aggressive emissions targets that might be adopted by the developed world, or as they are known in UNFCCC parlance, the “Annex 1” countries, essentially developed, wealthy democracies. In the Kyoto Protocol, however, China and the five other major emitters in the Group of 77—India, Indonesia, Brazil, South Africa, and Mexico, the latter now a former member and in a special position—were not required to accept mandatory CO2 emissions caps. The main argument was essentially one of justice. Developing countries, such as those represented by the Group of 77, did not put the CO2 and CO2-equivalent gases in the atmosphere that are causing current increases in global temperatures. Limiting these greenhouse gases, it was argued, would hamstring these countries’ attempts to reduce poverty. Further, even at current rates of emissions, it will take China a long time until its total cumulative emissions match those of the United States. Nonetheless, the exception for developing emitters in the Kyoto agreement was a key part of the objections to U.S. ratification as expressed in the now infamous 95-0 sense of the Senate vote in 1997 advising the Clinton administration not to even ask for approval of the treaty. It remains at the core of congressional objections to an international agreement on climate change. In hearings in the Senate Foreign Relations Committee earlier this month, Sen. James Webb (D-VA) spent most of his time questioning Todd Stern, the State Department Special Envoy for Climate Change, pressing for assurances that the Obama administration would not accept a new agreement that allowed China to get a free pass on emissions cuts again. Unfortunately this has left us in a quandary—if not a quagmire—with respect to the UNFCCC process. The large voting blocs—Annex 1 (developed) versus non-Annex 1, primarily the Group of 77 (developing)—are enormously cumbersome entities that generally fail to offer disaggregation among the needs and capacities of different member states. We can see this most acutely among the Group of 77. China, South Africa, and Brazil have enormously different carbon profiles, both in terms of absolute emissions and technological capacity for mitigation, than Chad, Suriname, or the Bahamas. The same holds true on the other side, where even with aggressive movement on domestic legislation, the United States will remain the largest per-capita emitter (currently four times that of China) for some time to come and hence a uniquely critical part of any solution. In addition, due to the sometimes impenetrable procedural rules involved in the UNFCCC, the United States has been able to participate in those meetings over the last 10 years and have a vote that effectively worked as a veto in the convention’s consensus process—even though the treaty was never ratified by the U.S. Congress. This venue for participation in the UNFCCC process was not always used responsibly by the last administration to say the least. Nationally appropriate mitigation actions by developing country parties in the context of sustainable development, supported and enabled by technology, financing and capacity-building, in a measurable, reportable and verifiable manner. Essentially, if the Annex 1 countries agree to financial assistance, technology transfer, and development of global markets in clean-energy technologies, then developing countries—most importantly the major emitters among them—will hopefully agree to emissions targets as well. And this brings us back to this week in Washington. By restarting the Major Economies Forum the Obama administration once again signaled its desire to seek as many possible opportunities to negotiate a set of agreements that could get us to a world of more fully shared responsibilities on climate change. Some may worry that the Major Economies Forum is an attempt to supplant the UNFCCC process and so is a threat to the historical integrity of that process in which most member states have been negotiating in good faith. Others see the Obama administration’s move as an opportunity to forge parts of the agreement suggested in the Bali Action Plan, which will be finalized in the final U.N. framework. Whatever the outcome, the Major Economies Forum should be used as one forum among many, including the Group of 20 meetings, where the two most important carbon players, the United States and China, can speak directly outside of the negotiating blocs which have dominated the UNFCCC. On the carbon mitigation side at least, there are good reasons to believe that we do not need an agreement of all the nations of the world but can pave a road to a viable future with only a small group—such as the major emitters now represented in the MEF. If the United States and China led the way, others would likely follow. Is China ready to talk? There are many indications that they are getting there, which again indicates that the Major Economies Forum process should be quickly ramped up in advance of the Copenhagen meeting rather than waiting for an outcome from it. Recent statements by top Chinese officials evince a new openness to adopting targets to reduce the rate of growth in carbon emissions. While that is a small step, it’s a significant one. Just as important, it now looks like China will exceed its own goal of a 20-percent reduction in energy intensity in less time than planned. Already there are indications that China is experiencing multiplier effects in their economy where green investment begets more green outcomes leading to more investment. 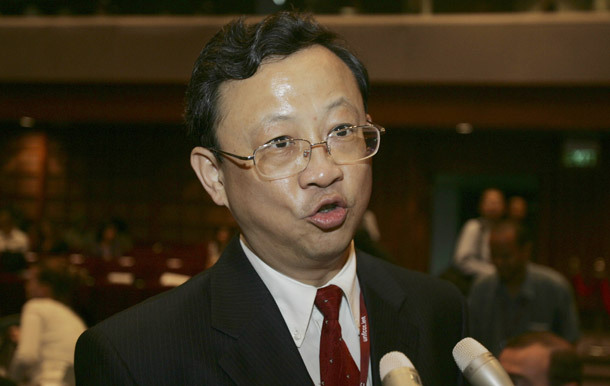 Senior advisors to the Chinese leadership, such as Tsinghua University professor Hu Angang and Chinese government climate change negotiator Su Wei are openly suggesting that China consider “carbon intensity” targets. And, perhaps most dramatically, a recent report from HSBC Global Research demonstrates that China is ahead of the United States in terms of its own green stimulus package. It’s a much bemoaned talking point in these discussions that China has far surpassed U.S. capacity in solar cell production since 2005. More striking, though, is that Chinese leaders are “investing $12.6 million every hour to green their economy.” China is spending twice as much as we are in the American Recovery and Reinvestment Act on green jobs and a green recovery despite the relatively larger size of the U.S. economy. It may be too early to look for a significant sea change, but there are a number of factors pushing China to a more proactive position. First, Washington is finally getting serious. “It’s not my problem” was a much easier stance for China to sustain when the Bush administration redacted reports about the costs and consequences of climate change and mucked about with an international treaty process while the world smoldered. With aggressive steps by the Obama administration—including the recent ruling that the Environmental Protection Agency has the authority to regulate carbon under the Clean Air Act—and legislation on a carbon cap-and-trade system now being debated in Congress, it is much harder for China to make excuses that they have no obligation to get serious until the United States gets serious. Is this a shout toward current discussions in Congress? No doubt. Some provisions for protecting specific industrial sectors have already been included in the current cap-and-trade bill now before the U.S. House of Representatives, and we expect to see more discussion of these instruments as legislation moves through the U.S. Senate. Third, the Obama administration has placed energy and climate at the center of U.S.-China relations, a strategy recommended by the Center for American Progress in a report from last year titled “A Global Imperative: A Progressive Approach to U.S.-China Relations in the 21st Century.” When Secretary of State Hillary Clinton visited Beijing on her first overseas visit earlier this year, she made it clear that the United States now viewed cooperation on energy and the environment as a key priority for the bilateral relationship. Fourth, the climate, both physical and political, is getting hotter in China as well. In January 2008, the United Nations Convention to Combat Desertification was held in Beijing, a megacity that is already severely swept by dust storms from western and northern regions every year. Shrinking glaciers are starting to cause serious water problems and more intensive damage in the country’s mountainous regions—problems that will soon stress the country’s capacity for short-term mitigation. Just as in the United States, the consequences of climate change are increasingly felt immediately and understood through direct observation rather than being confined to climate modeling. Popular unrest in response to environmental changes is also on the rise, with increased organized opposition to everything from the construction of chemical plants to river dams. A Chinese equivalent to laws in the United States that ensure citizen participation in environmental impact assessments will continue to provide raw material for this resistance movement. Finally, when the international community convenes later this year in Copenhagen to negotiate a new climate change treaty, it will include adaptation provisions that will require a larger global commitment. Only working together can we hope to save those in the poorest countries who will suffer first from the ravages of global warming. With the Obama administration now officially off the fence on climate change, the Copenhagen negotiations now stand squarely in front of China’s path to “great powerdom.” Great powers of tomorrow are saddled with responsibility to attend to their time’s great threats to humanity, or risk losing the diplomatic capital they’ve worked so hard to amass. The shifts we see in Beijing’s position could open up a much more constructive negotiating dynamic in the lead up to the Copenhagen meeting. A more positive give and take could begin this week with the opportunity the Obama Administration has created with the MEF. In Todd Stern’s testimony earlier this month he made it clear that the first priority for the United States in these meetings will be to push along the conversation on technology transfer as a key component of acceptance of emissions caps by the developing major emitters. In a recent visit to Washington, Xie Zhenhua, Vice Chairman of the National Development Reform Commission, reiterated that China’s commitment to accepting nationally appropriate reduction goals depends on receiving technology assistance. So here’s one recommendation, building on remarks by CAP president John D, Podesta at the beginning of April of the sort of project that could be pursued through the Major Economies Forum, or in other opportunities for one on one negotiations with China—a joint clean-coal project. Both China and the United States share an abundance of coal, a locked-in capacity for energy production from burning coal, a huge fleet of coal-fired power plants, and a need to demonstrate capacity for transformation of this infrastructure with carbon capture-and-storage technology. Given this common framework, a joint carbon capture-and-storage research project sited in China with $500 million in financing from the United States and $500 million from China, would be a good place to start. These funds could be used either to set up a joint research facility—similar to Australia’s Global CCS Initiative to which that country has committed $100 million per year towards operation—or a joint demonstration project. All technology produced from such a project would be free and unbound by patent protection and, perhaps, could be made available beyond the confines of this partnership to the broader international community. Given current interest in China in carbon-capture and sequestration technology technology, $1 billion in funding should be sufficient to build a 150-to-200 megawatt demonstration plant. At the moment a 600-megawatt plant is in the works in the United States, which will cost approximately $3 billion. But with the possibility of cost savings, other sources of co-funding, and the profile of China’s regulatory process, $1 billion may be sufficient to build such a plant in China. In addition to the value that could be generated for demonstrating capacity for carbon capture-and-storage technology in China by such a facility, it would also advance the G-8 agenda, agreed to last July, to deploy 20 fully integrated industrial-scale demonstration projects for this kind of technology by 2020. Of course, one problem with such a project is that full replacement of existing coal-fired power plants with newer, more efficient plants with CCS capacity will involve a long, expensive process necessitating —in the United States at least— the capacity for building some 30 power plants per year from 2020 to 2050. Another option for this proposed $1 billion in co-funding would be moving along research in the retrofit of existing coal-fired plants with CCS capacity. Such technology is not as far along in development, and given the difficulty in transforming the energy capacity of heavily coal dependent and less affluent countries—such as Poland—development of such technology could potentially do more good in a shorter amount of time. We would hesitate, though, to propose such a fund and then orient it only toward building capacity for one technology. If such funds could be better used to expand China’s existing solar thermal program, which we estimate could be increased to a 500-to-750 megawatt facility with $1 billion in funding, or to investigate another technology of more interest to China for which an infusion of directed basic research from the United States could be more of use, then that should be on the table as well. The point is that joint technological capacity building may be the best road to a new global energy future and help to stimulate the set of climate change agreements which will move us there. Such proposals should be discussed now and followed up at the next Major Economies Forum this July in Maddalena, Italy following the G-8 meeting. The official Chinese position on climate change remains—you broke it, you fix it. But a creative nudge on the U.S.’s part and a subtle shift in Beijing’s position could open up some real movement in the diplomatic lead up to global climate-change negotiations in Copenhagen. Nina Hachigian and Andrew Light are Senior Fellows at the Center for American Progress. To read more about the Center’s energy and environment policy proposals and our China recommendations, please go to the national security and energy and environment pages of our web site.